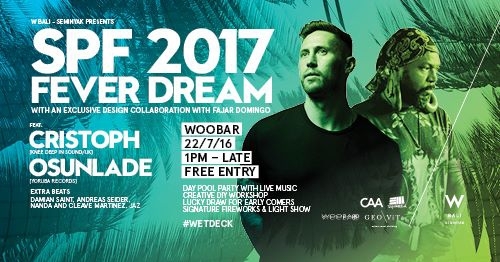 W Bali Seminyak brings you back its iconic annual summer party - SPF Fever Dream - with exclusive performance from international DJs Cristoph and Osunlade. The day to night party is designed in collaboration with Jakarta designer Fajar P. Domingo and will bring in a concept of Day Dream vs Night Dream. Day Dream is dedicated to fun and creativity: A day party with live music, Fajar P. Domingo X GEO\Vita beachwear collection launch, DIY workshops and a W Sound Suite Pop Up with jam sessions. Night Dream will culminate with two international DJ headliners, Cristoph and Osunlade~Yoruba Records, gracing the decks of Woobar for a night of music and dancing in style. Having now carved out a sound that is increasingly identifiable, the young producer avoids dance music's relentless march toward the new next thing by masterfully mediating through raw beats and textural trickery that gradually blurs the edges of genres; the focus on groove, mood and his typically intricate, hypnotic arrangements. Osunlade is an artist who personifies art. His music as well as his being creates unified melodies manifested with balance, life and wisdom. Hailing from St. Louis Missouri, a place known for pioneering blues, ragtime and jazz as well. Now known for his legendary dj sets, remixes and albums including several mix cd’s, Osunlade has placed himself on solid ground maintaining his reputation of unparallel quality in music.